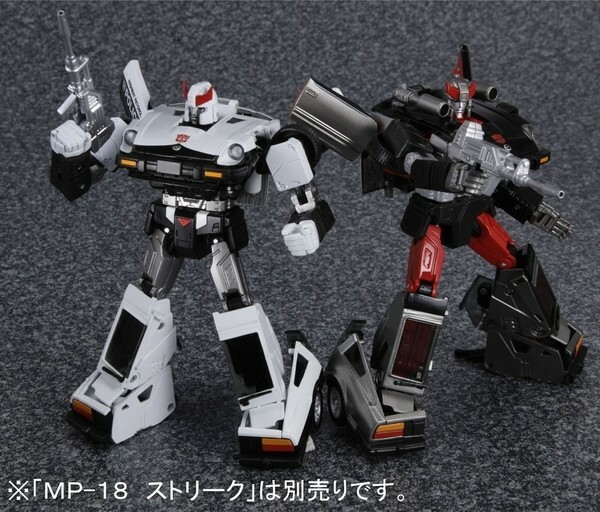 We have received new pictures from Takara Tomy for their upcoming Masterpiece MP-17 Prowl and MP-18 Bluestreak and Toy Garden/Toywiz will be taking preorder now for these figures! As the Sideswipe and Red Alert are sold out instantly, these figures will definitely be another hot Masterpiece collection for any Transformers fans out there! Preorder now! Prowl is the Autobot military strategist. As such, Autobot Commander Optimus Prime keeps Prowl near at hand for his indispensable expertise. Prowl is quiet, competent, loyal, and possessed of almost endless patience. Prowl’s dedication to logic and reason make him an excellent strategist, but not much of a socialite. He really doesn’t tend to get along well with his fellow Autobots, many of whom find his strict adherence to military protocol stifling, and his uptight personality sure doesn’t help matters. He does not react well to the unexpected, to the point that it can literally scramble his cerebral circuits. The Dinobot commander Grimlock, who is disorder made manifest, especially honks Prowl off, and Grimlock feels pretty much the same way in return, only with more swear words. He’s very fond of his acid pellets, though. Bluestreak is a talker. He talks a lot. Any subject, any time of the day, his lips are flapping while his Autobot comrades are rolling their eyes. Could be about things on Earth, could be about things on Cybertron, could be about just about anything, but the point is, y’know, he’s talking. Words are coming out of his mouth in a near constant prattling stream. Some think he’s vapid, that his mouth just moves a billion times faster than his brain, if his brain is moving at all. Or they imagine that he’s a fool who doesn’t know when to shut up, that he drones on and on and on and on because maybe he just likes to hear himself speak or something. His friends realize, however, that his jabbering hides a deeper pain. At the beginning of the war, Bluestreak’s home city was totally destroyed by Decepticons. He was the only survivor. It’s as if by talking he tries to drown out his own fears and memories somehow. “There’s some demons runnin’ loose inside that boy,” says Hound, “and sometimes I think they grab hold of him and won’t let him go.” He hated war, he still does, but ever since, he’s hated Decepticons even more. It is odd to see a bot of peace so willingly take up arms, but Bluestreak’s got a score to settle.